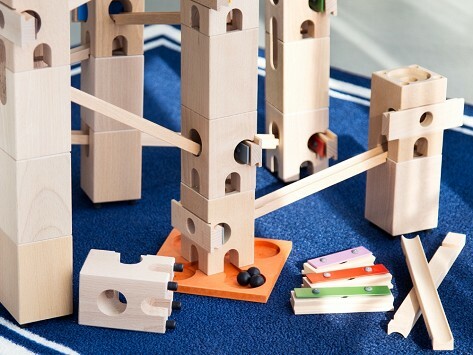 Xyloba is a creative marble run that combines construction and composing into a masterpiece. Build Xyloba in any configuration to make different tunes. Dimensions (in box): 21" x 10" x 3"
Excellent Toy for all ages! Excellent product, well made...kids and adults have fun with this! Bought as a Christmas gift for my musical husband. Excellent purchase-one the entire family has enjoyed! Xylophone meets marble run in Xyloba, a building toy that encourages creativity, construction skills, and music appreciation. Created by Samuel Langmeier, a Swiss cellist in the Tonhalle Orchestra in Zurich, this handcrafted wooden marble run lets you compose your own melodies within the towers you build. Langmeier was inspired by the chimes he heard in a toy marble run he found in his travels: What if a classic marble run could be made with a clear, rich sound that inspired kids to experiment with music? Forty-three years went into creating components that would improve sound quality, including beechwood tower parts, metal marbles, and interchangeable chimes. Though an included sound book offers song ideas, Xyloba’s intuitive building system is meant for musical discovery that is new every time you use it. A toy like no other, Xyloba promotes fine motor skills, expands the imagination, and makes music composition fun.